Finally our trip to California has started, and everything is going smoothly. The troop was (let's say surprisingly) on time! The girls where in their usual badda-bin-badda-boom hotness. We all were waiting for this trip since we decided that we wanted to go to San Diego, California. We picked Alamo as our rent-a-car this time. They had this awesome $30.00 discount coupon. Let me tell you, what a bargain it was! For a whole week we spend on the car $72.85 each and that is pretty good judging that California is very expensive state! Not only that, but we got the most economically "green" car in the market, the Fusion! So we got into the hotel and set ourselves easily into the rooms. Then we rested cause we have to get over the jet lag. Then, the next morning, we woke up early and headed into the famous area The Embarcadero. It is a very nice boardwalk where you can see San Diego's seaport life. 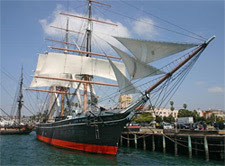 They have the oldest active sailing ship called The Star of India. We took nice pictures of us posing and the vessel on the background, pretty awesome! I can just picture Long John Silver or Barbarossa, or even Barbossa fighting with Jack Sparrow! We headed walking; cause is a very picturesque park, toward one of the most impressive maritime museums around the USA, the USS Midway Museum. This is a mayor aircraft carrier. Just prepared to be mesmerize with the sheer spectacle of seeing this amazing aircrafts that once flew over the Pacific. You can wear your pilot sunglasses and feel as if you are Maverick from the famous Top Gun movie! You’ll be hypnotized with the F-14-Tomcat, the famous A-6 Intruder, the TBM Avenger. Roger and I are into those late 70's old TV programs, and there was one that was about the Black Sheep Squadron, and when I said that, one pilot told me that they were restoring that one. He even said to take a little quick peek and let us see it. What a super major treat! plus, they have several other airplanes that had their cockpits open, and they have the stairs, so you can walked into the cockpit and have that feeling as if you were a pilot...the guys and I were like kids in a candy store, playing our sound effects of shooting an enemy in a pearl harbor type of air battle! The girls, well, they were playing hot navy nurses!